Note: Bottom of photo says "W.H. 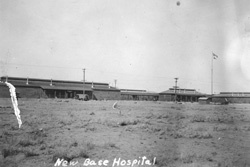 Horne Co."
Description: The new base hospital where sick soldiers are well taken care of. 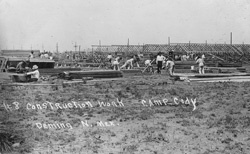 Unofficial estimates place the number of sick attended to in this institution at about 4000. Description: Mr. Mull, one of the many photographers who have made Camp Cody famous. The yucca plant is a large one found near the New Base Hospital. Mr. Mull was down with pneumonia and is somewhat thin yet. 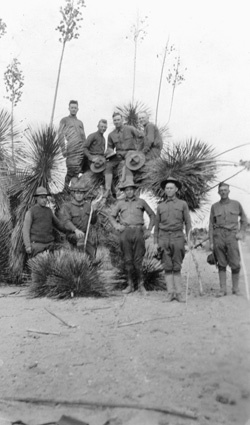 Description: A group of our boys in the desert near camp. 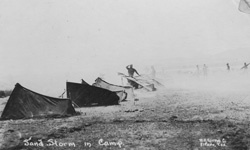 (From left to right); 1.) ?, 2.) ?, 3.) ?, 4.) Buller, 5.) ?, 6.) ?, 7.) ?, 8.) Hiebert, 9.) Dicksen, 10.) ?, 11.) ?, 12.) ?. The three men named are all Mennonites. 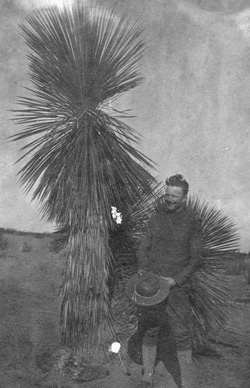 The plants are yucca, found near Camp Cody. Description: A group of non-combatants on top of "Red Butte", 8 miles southwest of Camp Cody. We are standing on the "Solid Rock"
Note: Back of this photo says " Give this photo to any one you wish. There are two of this kind in this bunch of pictures."